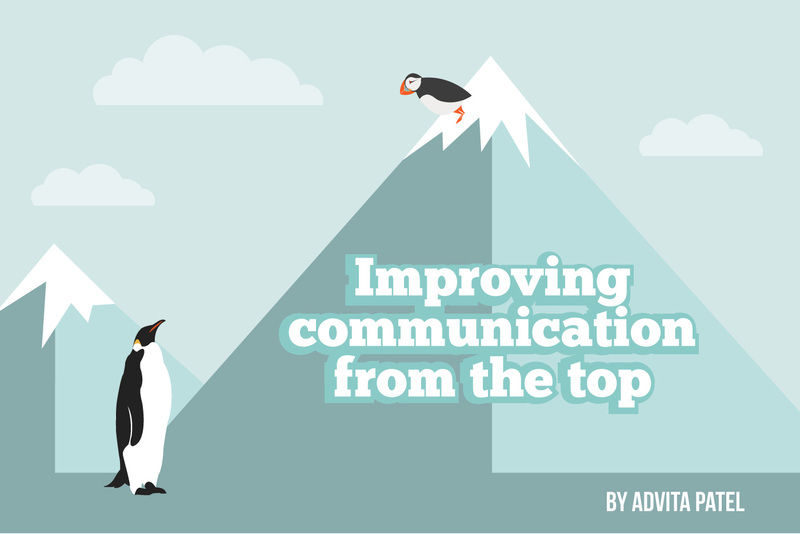 Only 13% of employees believe their senior leaders communicate effectively with the rest of the organisation. 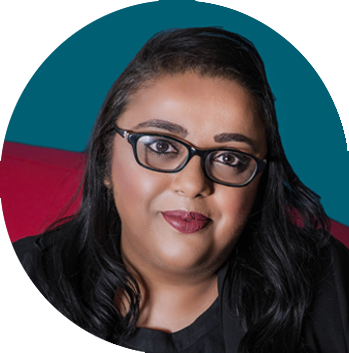 CIPR Inside Chair Advita Patel joins us to explore the ways internal comms professionals can work with senior leaders to transform their communication skills – and help them create messages that truly inspire and delight. I can almost guarantee that if I asked you to list the top three things you think make a good leader, ‘communication skills’ would feature somewhere on that list. It’s almost impossible to become a great leader without being a strong communicator. The days where technical skills or being able to talk a good talk could carry you to the top are gone. Below are a number of methods I’ve used throughout my career that have helped me support various leaders with their communication styles. Knowing where to start is often the first hurdle many of us need to overcome. 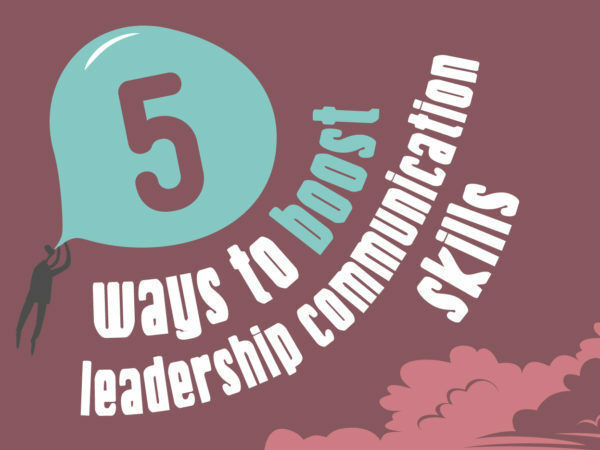 It’s not like you can walk over to a senior leader and say, ‘you really need to improve your communication skills!’. The first step would be to meet them for an informal chat over coffee, tea or a water and find out what their concerns are, and what they are struggling with. But while meeting for a coffee and having a general ‘getting to know them’ chat is great, to truly get the bigger picture it’s definitely worth spending some time with your leaders where they work. 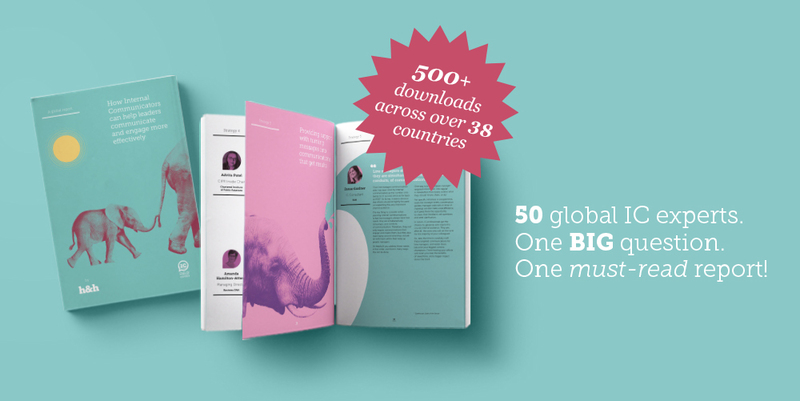 This will allow you to form a good overview of their communication strengths, which areas of the business need additional support, how often they communicate with their teams, and the challenges they’re facing, among others. These ‘work-shadowing days’ will also give you a good sense of team dynamics and engagement levels, which will be useful when you are supporting other campaigns and engagement strategies. With technology being one of the main modes of communication it’s really easy to fall into the trap of not meeting with people or teams face-to-face as often as we should. If you reflect back on a great leader you know or have worked with in the past, you’ll notice how they adapt their style based on the group or the person they are talking to. This can be difficult if they can’t interact with their audience physically. Spending time with their teams, even if it’s just an hour a month, is crucial if leaders want to truly understand what drives their employees’ motivation. 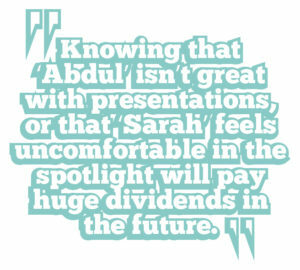 Knowing that ‘Abdul’ isn’t great with presentations, or that ‘Sarah’ feels uncomfortable in the spotlight will pay huge dividends in the future. 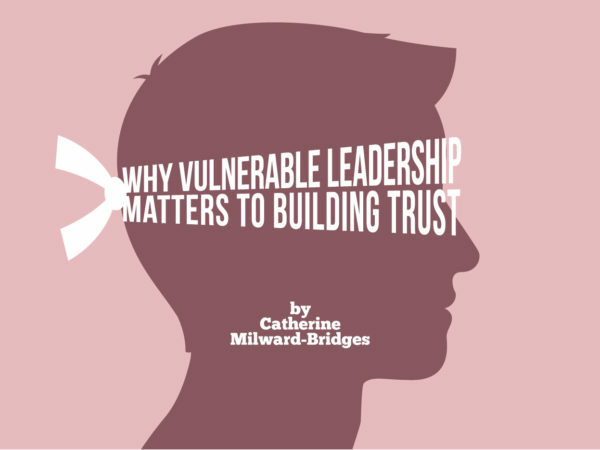 It also lets the team to know that their leader genuinely cares about them, and more importantly that they are listening – all this will help to increase trust! A lot of effort tends to go into building the reputation of leaders externally, but generally not much consideration is given to their internal reputation, which in my view is more important. 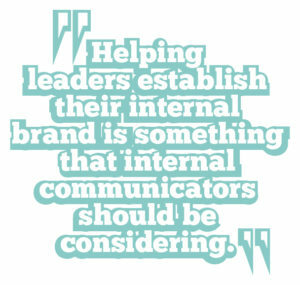 Helping leaders establish their internal brand is something that internal communicators should be considering. 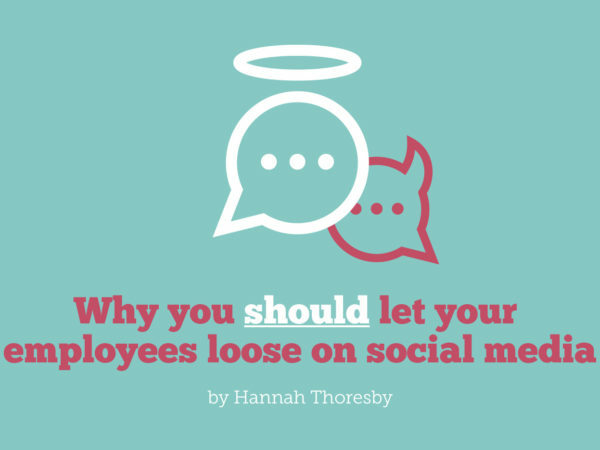 I’ve had debates with some internal comms professionals who feel it’s not their responsibility to develop their leader’s personal brand, but the ways in which leaders are perceived often relate to their communication skills – and this is something I believe internal communicators can really help with, alongside their HR and/or L&D colleagues. This may seem like common sense, but it’s really important that leaders feel comfortable in their environment. 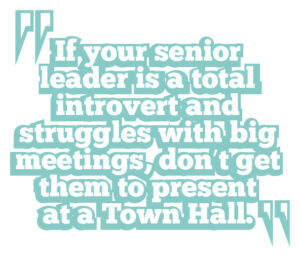 If they are a total introvert and struggle with big meetings, don’t get them to present at a Town Hall. Instead, think about hosting smaller meetings, or drop-in sessions, at least until they feel comfortable and have had appropriate coaching/support. If they struggle with being ‘put on the spot’, make sure they have a script to play off, or a briefing sheet they can use as a guide. These small differences can make a big difference to their communication style, and subsequently, how they are perceived. We’ve probably all sat in meetings where we have really struggled to stay engaged with what is being shared, and this is normally down to either a poor presenting style or a bad slide deck (or worse, both). I always, where possible, gather feedback from delegates via a survey or informal chats after every big meeting. This helps to give some clarity on what worked well and what could be improved for the next time – plus it takes the pressure off you having to be the only one to present a viewpoint. Use plain English. Try to encourage them to avoid using complex words or acronyms that people won’t understand. I once sat in a meeting where I felt like I was part of some sort of secret society due to the number of acronyms that were being used – I had to interrupt every 10 minutes to get them to clarify what they were talking about, but other colleagues may not do the same! Keep it brief. I know it’s easier said than done but having any more than 50 words on a slide is just pointless. 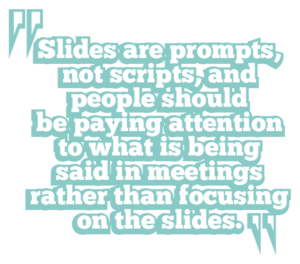 Slides are there as prompts, not scripts, and people should be paying attention to what is being said rather than focusing on the slides. Engage more. There should be no meeting ever that doesn’t include the employee voice in some form, even if it’s as simple as allowing time for questions. Having one person talk for a significant amount of time will definitely switch people off, unless the meeting is short and succinct and lasts for no more than 15 minutes. Speak up. Straining to hear what a leader is saying is not great. It just makes a mockery of the meeting and you spend half your time asking your colleagues what was said afterwards. Where possible bring in a mic (if budget is an issue, you can buy good-quality mics and speakers for a minimal cost). Stick to the plan. There is a big difference between communicating well and being a good speaker. Try to encourage your leader to stick to the agenda or the subject in hand and avoid going off on a tangent – people will not appreciate having their time wasted. None of the above tips are revolutionary, but I know that some internal communicators often struggle for time and support, especially if IC is seen as more of a tactical function in their organisation. There is no denying that you will probably face a few challenges, and it may be difficult to engage in conversation at first – particularly if you’re new and are still building your own reputation. However, the payback that your leaders will see once they make some of these small changes will demonstrate the value you can add to their communication skillset – so keep persevering! I have worked in internal comms for the past 14 years and am extremely passionate about helping people and organisations to be the best they possibly can be. I’m currently leading on the comms front for a transition programme with the Nuclear Decommissioning Authority, and sitting on the CIPR Inside committee as Chair. You can find me writing about everything I-related on my blog, icwords.com. Come say hi! to me on Twitter and LinkedIn! Inspiring and confident leadership is essential for engaging employees. Our bespoke leadership-development programmes equip your leaders with the knowledge, skills and competence to deeply engage, involve and connect everyone – whether on the shop floor or in head office. 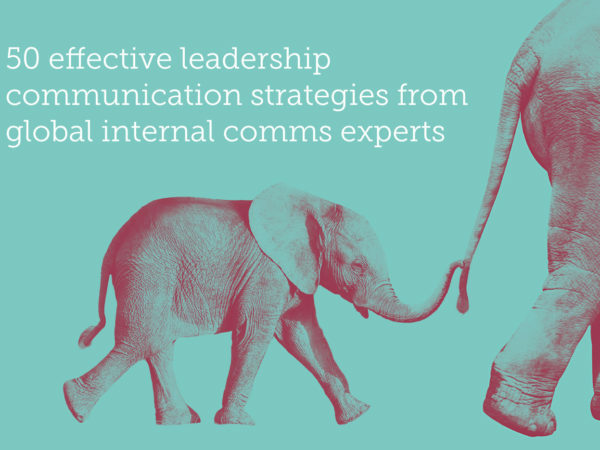 Get in touch to find out how we can help transform your leaders into exceptional communicators!